“As the FBI conducted a background check on an incoming senior White House official last year, the bureau learned of the man’s history of domestic abuse. 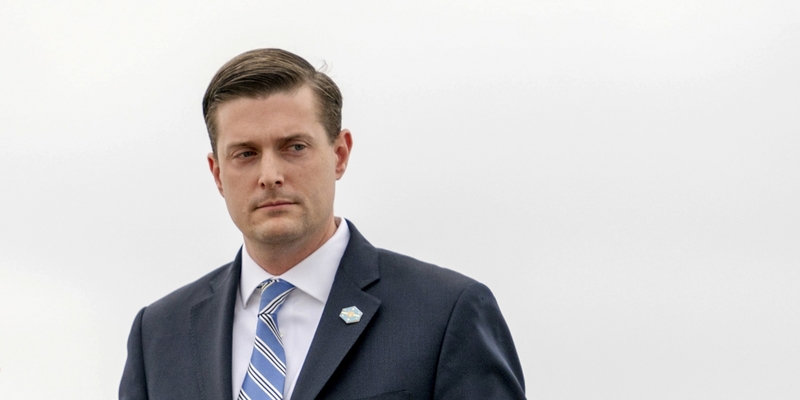 Rob Porter, a top aide to President Donald Trump, physically assaulted both of his previous wives, according to the two women. Porter’s first wife said she was physically abused for years, providing a photograph she took of herself after she said Porter hit her while on vacation in Florence, Italy — a photo she also shared with the FBI. During the background interviews for Porter’s security clearance related to his senior White House role, FBI agents interviewed the two women. The former wives told the FBI that Porter was abusive during their marriages, according to interviews with the women. For Porter, the FBI interviews marked a collision of his professional ascendancy and his sometimes violent private life. Colbie Holderness, Porter’s first wife, provided her correspondence with the FBI to The Intercept. (The FBI did not respond to a request for comment, and the agent involved in the exchange declined to speak about the case.) In an interview, she said the pattern of violence in her marriage to Porter began on their honeymoon in the Canary Islands in 2003 and continued from there. Photo was taken shortly after the alleged incident, in the hotel room in Florence. Porter resigned Wednesday, with an undetermined effective date, amid the allegations. Porter did not respond to requests for comment from The Intercept made through phone calls and text messages. Nor did White House Press Secretary Sarah Sanders provide a comment in response to a query about Holderness’s detailed allegations and photo. In remarks to the British tabloid the Daily Mail, which reported some of the allegations of spousal abuse, Porter denied some of the charges and a raft of White House officials and one U.S. senator spoke to the strength of Porter’s character — all before Holderness detailed her part of the allegations to The Intercept. Porter has kept a low public profile but is reported to be a powerful figure in the White House, a gatekeeper of the flow of information to Trump. According to Politico and the New York Times, Porter, the White House staff secretary, has been part of a two-man team, alongside Chief of Staff John Kelly, who decides what makes it to Trump’s desk. In Florence, Holderness took photos of her face and emailed herself copies, which she shared with The Intercept. Porter’s second wife, Jennifer Willoughby, wrote about her abusive relationship in ablogpost on April 24, 2017, but did not name Porter. After finding the blogpost, The Intercept independently identified Holderness as Porter’s first wife and approached her for an interview. On Tuesday, the Daily Mail published an article linking to the blogpost, which Willoughby confirmed to the British tabloid was written about her marriage to Porter. Willoughby and Porter’s marriage ended in 2013. Sanders, the White House spokesperson, offered equally effusive praise in his defense. “I have worked directly with Rob Porter nearly every day for the last year and the person I know is someone of the highest integrity and exemplary character,” Sanders told the Daily Mail. Shortly after the attack in Florence, Italy. COLBIE HOLDERNESS, WHOSE maiden name is Paulson, met Porter when she was a freshman at Wellesley College. At the time, Porter was a student at Harvard University, where he served as a leader with the Harvard Republican Club and Harvard Students for Bush, according to Harvard Magazine. Porter had gone on a Mormon mission before returning and meeting Holderness. The relationship made a brief appearance in a 2001 Rolling Stone article about Wellesley, a women’s school. The couple wed two weeks after graduation, following three years of dating. The marriage went bad quickly, she said. On their honeymoon on the Canary Islands, they were standing face to face, arguing, and he kicked her, Holderness said. She was stunned, and also puzzled. In her blogpost, Willoughby, the second wife, noted that Porter had kicked his first wife on their honeymoon. Holderness confirmed she had told Willoughby about the incident. While Porter was at Oxford on a Rhodes scholarship, Holderness landed a job with the governor of Idaho, her home state, which she said she taken partly to escape Porter’s abuse and further her own political career. She became friends with Trish Stack, who worked with her in the office in 2004 and 2005 and is now a marketing executive in Boise. Holderness confided in Stack about the abuse, telling her how it began on their honeymoon. Holderness was eventually accepted to the Kennedy School and moved there with Porter in 2005. Stack said Holderness continued to confide in her. “She was trying to get help, and nobody would help her,” Stack said. By the end of 2012, the couple had separated again and divorced the following year. Willoughby said Porter repeatedly asked her to take down the post, but she declined.